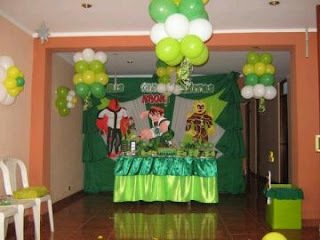 One of the favorite characters for children is undoubtedly the brave Ben 10, for sure your little one already has at least some of the toys from the animated series, or one of its powerful accessories, if so, why not make a great birthday party in whose decoration Ben 10, is always present? 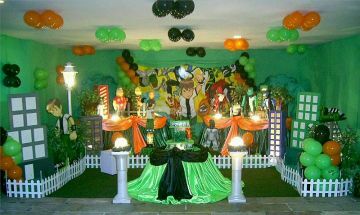 Here are some decorating ideas hoping that one or more of them help you with this important celebration. 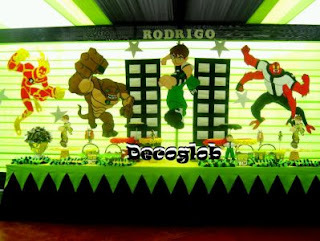 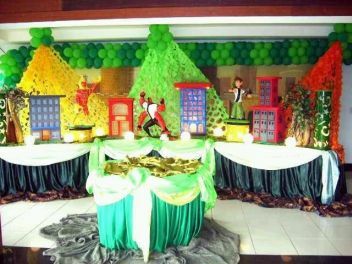 In this first you have to use cloth pads and the figure of Ben 10 in the main, this type of decoration is ideal for open spaces or outdoors. Another example of outdoor decor, it comes to decorating the table with the most important of the series, the perfect backdrop in this case, are the trees of the place, remember it is important to cover the head table, ie to provide it with roof to prevent food spoilage placed there. Other decoration with the use of sheets of cloth and on them the characters, in this case is supplemented with balloons decoration suspended from the ceiling. 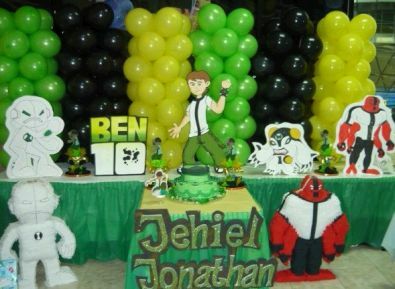 Beautiful and complex presentation of the mini city of Ben 10, the use of buildings, figures of the characters, lights and ribbons, perfectly complement the balloons attached to the ceiling. Another idea made with balloons and colored tights as a backdrops, inevitable, buildings and figures from the animated series. 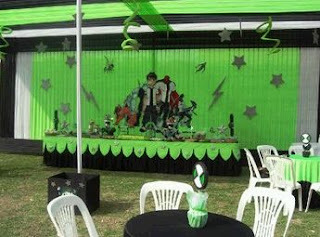 Great decoration, use cloth fabric on walls and ceilings and the characters in the back, if you use this type of decoration in open, daylight plays an important role and gives it that magic touch, just as shown in the photo. If you prefer balloons, balloon columns of colors characteristic of the series, remember to always place the characters in front of the arrangements. 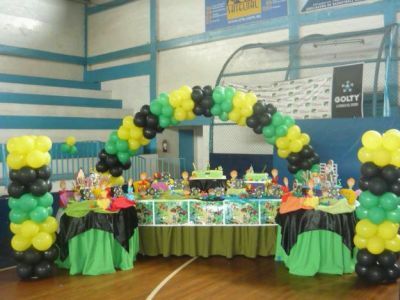 Another example of an arrangement with balloons, in this particular case, it is an arc in the rear and two columns in front. 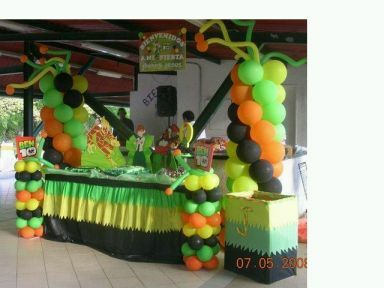 Finally, we have arrangements with columns of balloons, the original detail is in the top of the columns, it is thin and long balloons end of which have a round, as an antenna. I hope you liked the proposals. 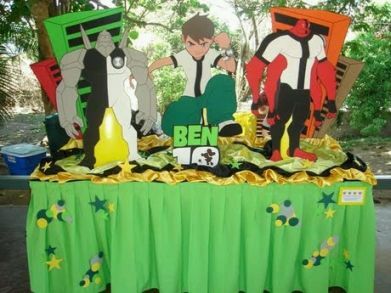 Love the ben 10 n alien çutouts. Where did you get 'em from?